I grew up poor. I'm not talking about the kind of poor where you couldn't have an iPod and got some cheap knock-off MP3 player at Wal-Mart instead. I'm talking about the kind of poor where you were hunting down bottles that could be returned for a deposit at the end of the month so that you could buy milk. Given that situation, I was very familiar with the type of crappy cheap food that poor parents buy to just have something on the table like store brand macaroni and cheese which could be had for 5 boxes for a dollar on sale. Of course, I'm 46 and I'm guessing that you can't get even crappy mac and cheese for that price anymore. I mention this not to elicit sympathy for my youthful poverty, but to talk about cheap, crappy food that people buy because it fills the space. One can guess that this S & B Keema Curry falls into that category. Most of the better quality prepared curry prepared food sold in foil bags at market costs between 250-400 yen ($3.03-$4.86). This costs 100 yen ($1.21). I found it at Lawson 100, but you can also find it at Seiyu supermarket for a "discount price" of 98 yen. S&B is famous in Japan for it's spices and I have a few jars of its product in my refrigerator. I choose their spices mainly because they're in small bottles and cheaper than imported varieties. Most of what they offer is relatively mundane stuff. You wouldn't find something as "exotic" as cardamom in their packaging, for instance, but they're good for work-a-day options like parsley or turmeric. 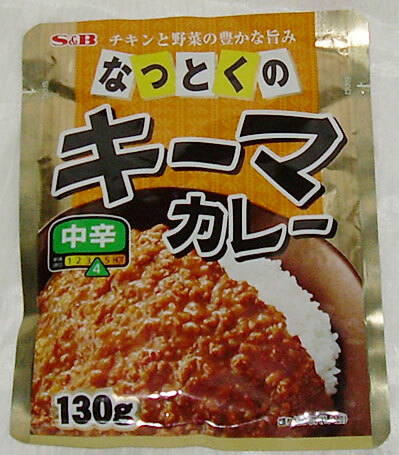 I chose this keema chicken curry from the plethora of other cheap curry options at the 100 yen shop mainly because when I squeezed the package, it was lumpier than the rest. I figured that this meant there was more "meat" in it. Okay, the truth is that I assumed it had more TVP (textured vegetable protein), but the point was that it had what felt like more substance than the others and the calorie count wasn't too bad at 145 calories. 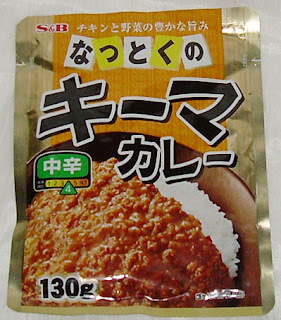 It also has 11.8 grams of protein which isn't too shabby for a 100 yen foil pack of junky food. The main drawback is that it has 2.5 grams of salt when the daily amount recommended for an adult is 3.8 grams of salt. Given that latter bit of information, I expected it to be salty, and boy howdy, were my expectations fulfilled. This is a mildly hot curry and could use more kick, but has a nice savory undertone and more depth of flavor than many of these cheap preparations. You can't really taste the chicken as an individual ingredient, but you can get a real sense of it in the texture. In terms of the spices, you can really taste the ginger and something which seems like celery salt in flavor (but is not). I don't have this often, but I do like to have it occasionally when I have a few ounces of leftover chicken and a bit of rice on hand. Adding 2 oz. of bland chicken breast helps cut the saltiness back a bit and the flavors are sufficiently intense that adding unseasoned chicken to it doesn't dilute the intensity to an unacceptable level. I wouldn't recommend this as an "every day" or even a once a week sort of thing because of the high salt content, but as a bit of cheap comforting junk food on occasion, it's pretty good. Dydo is one of the first Japanese drink companies that I heard the name of, though I didn't come across it firsthand. My husband, before he was Mr. Orchid64, spent a year in Japan alone as a teacher and sent me a picture of a Dydo vending machine and with our inexperience with Japanese culture at that time, we thought it was a funny-sounding name. Little did we know that there were far more amusing words to be discovered. I don't see many of their machines in my particular neighborhood, and honestly don't recall seeing many of their drinks on store shelves. This was a little surprise to me when I discovered it in the cold drink case at a 100 yen ($1.20) shop in a neighboring area. The inclusion of grapefruit as a flavor is what drew me in, though I haven't had the best experience with grapefruit drinks in the past. Peter Rabbit is pretty popular in Japan among the young women set. Kids don't seem so much into that character, but university students and young OLs are known to pick up Peter Rabbit goods at expensive import shops like Sony Plaza. Unsurprisingly, this is promoted as "woman friendly" due to its zero calorie status. They catch your eye with Peter Rabbit, and get you to buy it because it won't make you fat. The character is so popular that about 25% of visitors to the cottage where the character was created are Japanese. I find myself wondering just how much Dydo had to pay the estate of Beatrix Potter to use this character. A whiff after opening the bottle reveals both tea and citrus fruit, unsurprisingly. The ingredients include grapefruit and the scent really confirms this. The taste is a balanced blend of grapefruit and plain tea. The grapefruit flavor hits the tongue first and the tea after, but both are there clearly and cleanly. The bottle mentions that ginger and honey are also flavor components, and one can detect the faintest hint of honey and ginger. Since this is a zero calorie drink, I don't understand how both "grapefruit sugar" and honey can be ingredients and keep the calories at nothing, but there is a note that says that this is not absolutely zero but less than 5 calories per 100 ml. This is a pretty nice tea. I can detect complex flavors and everything that is promised on the bottle's label is present. If you are sensitive to artificial sweeteners, you may not want to try this. If not, it's certainly worth a taste. I'd buy it again if I found it and was in the right mood. It's refreshing and has the right amount of pretty much everything to make a tasty fruit tea. In my other blog, I mentioned that one of the things that I get a kick out of are "unamerican American things". I'm sure that there are likely unjapanese Japanese things in the U.S. as well, so I'm not mocking the Japanese or anything, just enjoying the irony and ludicrousness of what I stumble across. I saw this curious display of "U.S.A. Premium Cola" outside of a grungy discount supermarket next to a grungy discount green grocer that I buy my carrots and onions at. 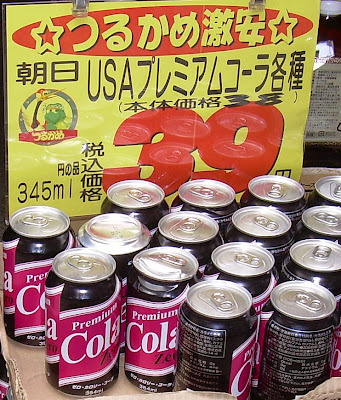 The soda isn't made in America and has Japanese writing everywhere except on the design-challenged label. It's clearly one of those Japanese products that is marketed as "American" for reasons I have yet to understand. 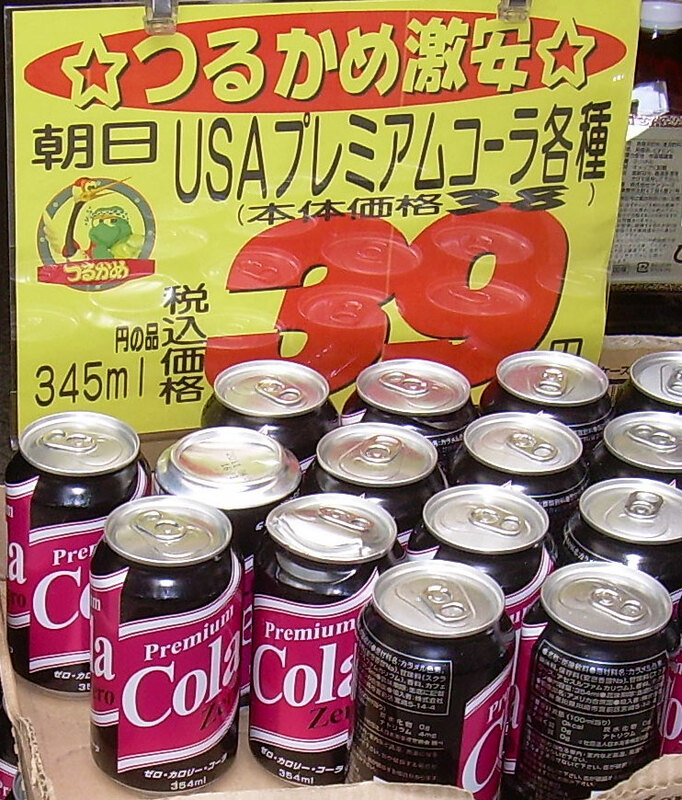 The weird thing about it isn't only that it's only 39 yen (47 cents) a can, but that it's also a diet soda. While it's common back home to find soda for sale for very low prices, it is extremely rare to find anything cheaper than 50 yen here, and usually those are tiny little cans that only contain about 200 ml. of drink. I guess that if the flat-tasting and third-rate RC Cola can call itself "Royal Crown", then this crappy stuff can sell itself as "premium". To my recollection, Pepsi has come out with these odd flavors only 6 times. The first was cucumber, which I did not sample. That was followed by Pepsi White, Pepsi Shiso, Pepsi Adzuki, and most recently Pepsi Baobab. I don't include the Pepsi Strong Shot in this cavalcade of weirdness because it didn't taste different than the usual Pepsi. It was simply hyper-caffeinated and more carbonated. In my opinion, Pepsi has been moving in a steadily better direction with it's limited edition flavor choices, and they've also been doing more beautiful label designs with each one of these. The Pepsi Mont Blanc label is lovely with a wintry motif that conveys the elegance of the dessert it is modeled after. Of course, it could simply be that Pepsi has made a flavor based on my favorite dessert and I'm strongly inclined to believe their synchronicity with me constitutes a "good choice." I picked this up for 147 yen ($1.82) for a 490 ml. bottle at a Family Mart convenience store. I'm not sure why 10 ml. has been shaved off of the usual 500 ml. serving of these types of drinks, but there it is. It was just released today and should be around for a few months. Though it's unlikely to be on all of the "konbini" shelves for longer than the first month, it will show up at other shops after its initial release. Note that the Pepsi Baobab lingered in boxes at sad little discount shops up until sometime last month. I got the feeling it didn't sell particularly well though I did like it. I had good hopes for this and when I unscrewed the cap and gave it a whiff, I was greeted with chestnut notes though they were fairly artificial smelling. The best way to describe the smell is like a cross between a cream soda and root beer. The flavor also carries a bit of a cream soda feel with a chestnut finish. I'm guessing there is vanilla in it and that's why cream soda keeps coming to mind, but there is also a bit of a brandy or liquor-type flavor going on. This would be intentional on the part of Pepsi because mont blanc desserts are chestnut paste which includes sugar and often brandy. This tastes nothing like Pepsi, and it is unique but fairly tasty. The first sip in particular tastes very good, but the finish feels a bit flat and earthy. I'm not sure what that is about, but it tends to fade a bit as you drink more. Still, I liked this, and while I wouldn't drink it everyday, it is a nice change of pace, especially if you want a sweet soft drink which you're having instead of a treat. Note that this has 42 calories per 100 ml. so drinking the entire bottle is 205 calories. You won't be saving yourself any calories by having this instead of dessert, but you will be having a novel experience. 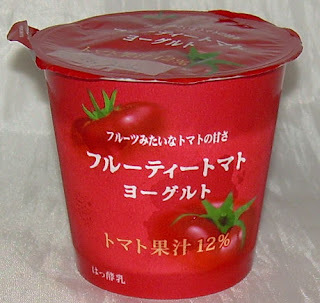 Lately, cartons of freeze-dried strawberries have been on sale at 7-11. They're pretty expensive for a relatively small portion. About 11 or 12 white chocolate covered strawberries about the size of a jawbreaker cost around 800 yen ($8.74) at the convenience store. This particular version by Rokkatei is 115 grams and costs 550 yen ($6.00). 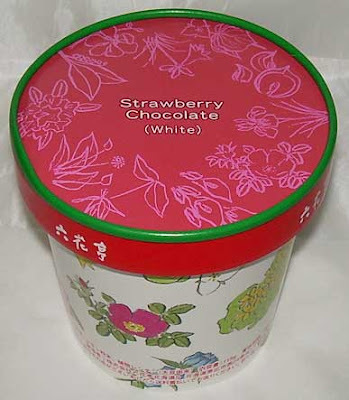 These are often purchased by Japanese people as a more elegant food gift or souvenir. Note that neither my husband nor I bought these. They were given to us as a gift. He loves strawberry and was very curious about these when we'd seen them in 7-11. Personally, I was less enthusiastic about the idea. Freeze-dried food doesn't really make my motor roar, nor does white chocolate. 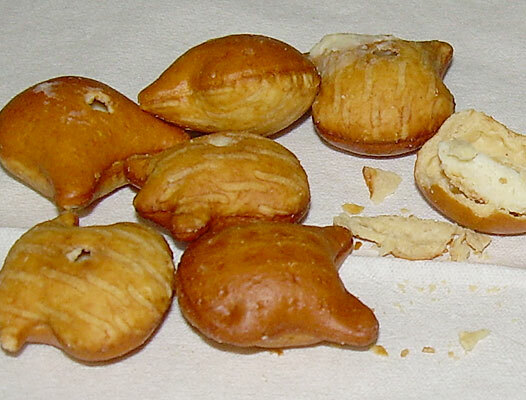 These smell only of white chocolate, even when cut open. The freeze dried strawberry feels like a wet sponge and at first tastes like dust on your tongue. After your saliva moistens it, it's like a rubbery blob. Most of what you taste is white chocolate with a strawberry aftertaste. It very much tastes like something is wrong with the strawberry, like it's been overcooked or is ready to go bad. The inclusion of real strawberry in these is worse than artificial strawberry. The best thing I can say is that the white chocolate isn't throat-burning sweet. In fact, it's relatively tasteless. These are supposed to be elegant, but they're really just not good at all. I only ate about 2/3 of one and I tossed the remainder in the trash. I wouldn't recommend these to even the most die-hard strawberry fan. For those who aren't familiar with Tirol (or haven't been paying attention to my prattle about them), there are two types of them on offer in Japan. 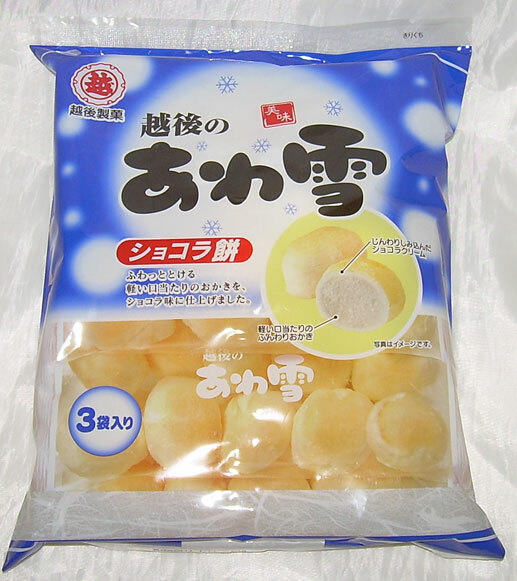 One is a small version sold in variety packs with 9 candies usually in 3 or 4 flavors for around 100 yen ($1.20) per bag. The other is a slightly larger version (about 1" square) sold as a "premium" version for 20 yen (24 cents). The small type is about 2/3 the size of premium version. The reason this distinction is of value is that the smaller ones are made with less sophistication and care than the larger ones, and this "hot cake" version was first released some time ago as part of variety pack. I didn't review the non-premium version because I refused to buy 6 candies I didn't want to sample 3 that I did want. However, Ebidebby at Snack Love reviewed it. The basic structure is the same, but the premium one has more sauce and the sauce is separated from the crispy biscuit. It is protected from getting soft from contact with the sauce by a layer of white chocolate. It's these little touches and a marginally larger size only that separate "premium" from regular. I found this at at NewDays convenience store for the aforementioned price of 20 yen, but they are available at most convenience stores. This little morsel is only 51 calories, which will give you about 2 bites. Once you open the wrapper, you smell sweet, sweet maple syrup. 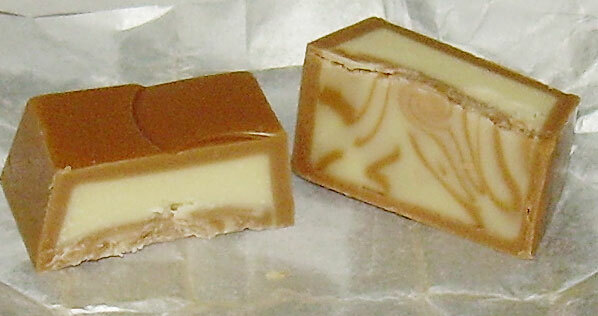 The white chocolate outer portion is super soft and it nearly melts on your fingers at room temperature. The interior is a nice crispy cookie. It tastes like super sweet white chocolate with only the barest hint of maple. Mainly, it is dominated by a powdered sugar flavor. I didn't detect any "hot cake" or pancake flavor at all. I think the bland little biscuit in the center is supposed to be a surrogate for the hot cake, but it's not a very capable replacement. This was rather a great disappointment because it's just pretty much a throat-burning sugar bomb with very little flavor. If it hadn't been so small, I probably wouldn't have finished it. To be fair, I'm not a great fan of white chocolate, so I reacted more unfavorably to this than others might. If you can find it cheap and adore white chocolate, it still may be worth a try, but if you have to acquire it expensively via an importer or hate super sweet candy, give it a miss. I've known about this product since last spring when I reviewed the same company's cheese mochi sembei, but hadn't located it. The reason why I couldn't find it is that it is seasonal and is only produced between September and March. I guess they feel that it's too dangerous to put even sembei that includes chocolate out there if we're in the 5-6 months of summer weather in Japan. Since I found the cheese mochi last April, it means I just missed it. I found these at Okashi no Machioka discount snack shop for 198 yen ($2.37). It includes 3 pouches of 20 grams (.7 oz.) each and there are about 115 calories is in about 10 balls (the contents of one pouch). You can probably find them in other markets or possibly even convenience stores since the company is a major snack maker. Note that these are not a "healthy" sembei option as the first ingredient is sugar followed by vegetable oil and then rice starch. Some things really defy explanation because they are so unlike anything you have ever tried before. Let's start with the idea that this is sembei, but it's "fluffy" and chocolate. And the name actually describes the product accurately. 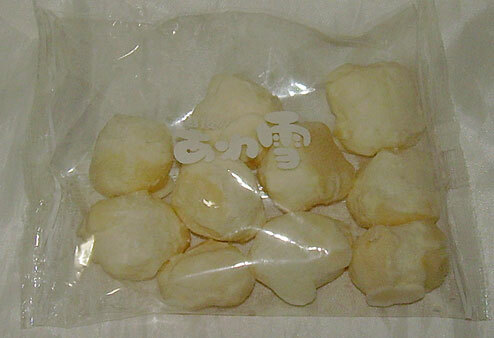 These balls of rice-based puffy goodness pretty much melt in your mouth. They are soft and cool on the tongue. 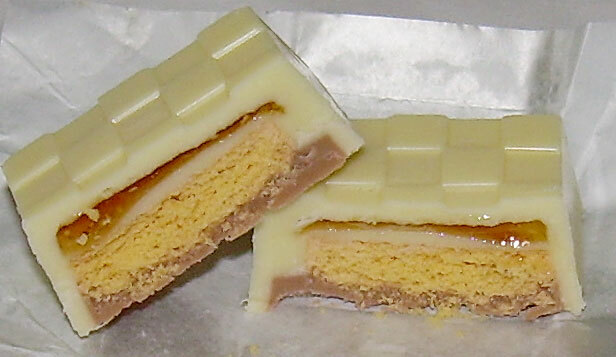 The exterior is very sweet with a sugary white chocolate coating. It may be hard to accept this, but they taste like vanilla ice cream. Given their texture and properties, eating them is like having sweet ice cream without the pesky need for refrigeration. I really liked these, but I recognize them as a "sometimes" snack because of the high sugar content. They are absolutely worth a try if you can get your hands on them. The experience is both unique and enjoyable even for picky palates. Frankly, this is the kind of product that keeps me reviewing new snacks. It's rare to come across something which is so unlike anything I've had before, yet very approachable in its flavors, but when I do, it feels like hitting a home run. The only way you're not going to care for them is if strong vanilla flavor doesn't appeal to you or if you don't like fairly sweet things. Click this small picture for a larger one. This is a display that drew my attention at a drug store I never shop at. If you can read Japanese, you already know this isn't what it appears to be. 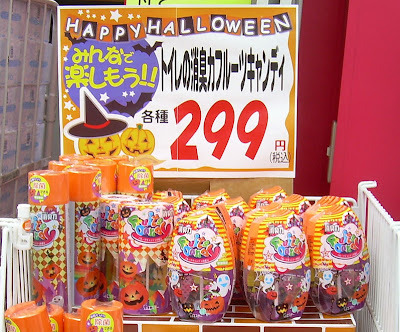 The English says "fruits candy" and displays a Halloween motif. This is actually a toilet bowl freshener that looks a lot like a candy display. If you really didn't know what it was, you might think that plastic rod in the center was some sort of lollipop stick. It certainly works for drawing the eye, but it didn't persuade me to open my wallet. I won't be forking over 299 yen ($3.63) to make my toilet smell like a chemical factory that makes fake fruit-flavored candy. When I was titling this review, I was thinking about what I should call them. They're not quite cookies. They're not quite crackers, and though they're made with pretzel-like shells, they're definitely not them either. Like Pocky, I'm thinking Pucca is in a class by itself. The closest way to describe it is as a sweet version of a Combo that is made with more finesse and care. 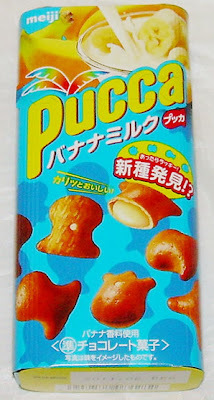 I reviewed the classic Pucca with a chocolate filling and I liked it a lot. It was only that fact which drew me to sampling this banana milk variety. The truth is that I'm always a bit of wary of banana-flavored foods because they are often very fake. The main point about Pucca that works for me is the contrast of the pretzel-like coating with its rye flour notes and the sweet filling. I hoped that would work for this as well as it did for the chocolate version. The cookies smell like strong, somewhat fake banana. The filling is super sweet banana with just a hint of a vanilla flavor. The "milk" part doesn't really come through strongly, but it's something you sense more as a creamy texture in the filling. On the first bite, you really mainly get the overwhelming sweet banana flavor. By the third, the sweetness detectors on my taste buds were overwhelmed enough to start picking up the pretzel exterior's unique and pleasant flavor. As is the case with all Pucca, the outer shell is thin and crispy and the filling is fatty and creamy. The entire box is 237 calories or about 10 calories per fish. I liked these, even though the banana flavor is undeniably strong and fake and they're incredibly sweet. It's fake in a good kind of way though my husband didn't care for it (and he's generally less fussy about such things than me). I can't recommend these for just anyone, but I can only say I'd consider buying them again. They're cheap at 100 yen ($1.20) for a 46 gram (1.62 oz.) box and so intense in flavor that you don't have to eat many to feel satisfied. I'll be honest. These days the chocolate sections of most stores leave me a bit cold. A lot of it is a reissue of things I've already reviewed in slightly different or the same packaging. Japan is big on seasonal and "limited edition" stuff, but I'm starting to see that what goes away almost always comes back. For example, the caramel purin KitKat in Halloween packaging has made a return visit this year as the season of the jack-o-lantern is coming upon us. It's still tasty, but it's less interesting as a repeat. I'm really only interested in something new. 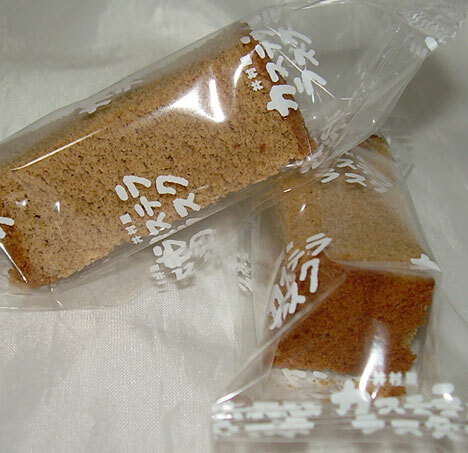 Fortunately, Meiji offered something which would be common back home, but is relatively uncommon in Japan. 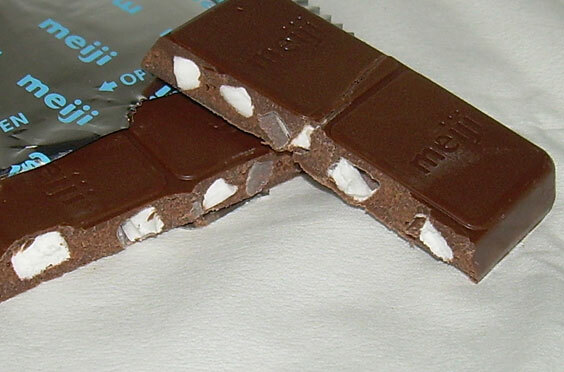 Marshmallows and chocolate are not usually combined in Japan, though marshmallows are incorporated into a variety of other snacks. There aren't enough for me to indulge in a "week of marshmallow snacks", but I wish there were. I love marshmallow anything and the combination of chocolate with it in particular. 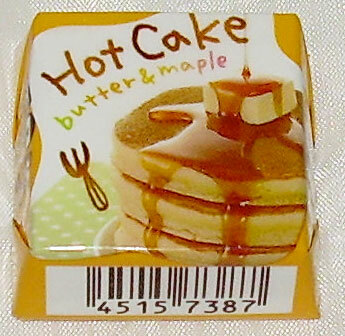 This large bar, 42 grams or 1.5 oz., can be had in almost any shop in Japan for about 100 yen ($1.20). I can't even remember where I bought mine, but I think it was a drug store in my neighborhood. One thing about any product made by Meiji is that the distribution is pretty wide and the products quite accessible. They're probably bribing store managers and stock boys nation-wide to ensure that this situation continues. The ingredients list is relatively simple. It's chocolate, marshmallow including gelatin, cocoa butter, and powdered milk. I don't know if the gelatin is Japanese-style and made from seaweed or Western and made from hooves, but I'm guessing the former. 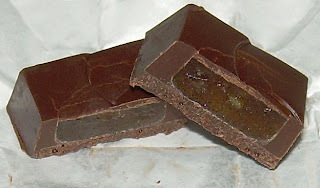 The bar doesn't smell like much of anything, which is odd because chocolate usually smells like chocolate. The taste is sweet, milky, mild chocolate with a little hint of marshmallow. The marshmallow bits, while quite visible, are not all that intense. Mainly they add a textural element. The bar has a firm outside with a softer interior. Inside, it is actually creamy and the marshmallows are soft and slightly sticky. The entire bar has 229 calories or 23 calories per square. This has a nice, mild flavor with a little too small an amount of marshmallow for my tastes. It is pleasant nonetheless. I think that compared to most Japanese chocolate offerings, this is notable because it lacks the bittersweet notes you often experience and lacks sour or bitter aftertaste that comes along with it. While I was a little disappointed at the less than prominent use of marshmallow, I'd still buy this again. When I was a kid, I loved tomatoes so much that I'd eat one like an apple. I'm guessing that back then they were better tasting tomatoes than they are these days, but I still eat raw tomato several times a week, if not everyday depending on how the prices are looking. I mentioned in some previous posts that tomato seems to be a fad food in Japan at present and you'd think I'd be happy about that, but the Japanese can take something as pure and fabulous as a tomato and pervert it into something bizarre and disturbing. There are tomato gelatin desserts, candies, and caramels. The caramels are an especially scary concept as they are packaged and presented like these Kabaya caramels that I reviewed previously. I think that there was potential for this to be good depending on how things came together. Plain yogurt, especially Greek yogurt or yogurt cheese, could go decently with tomato. It's not out of the realm of possibility that this would be nice. Well, it isn't! When I peeled off the foil and gave it a sniff, it smelled like regular yogurt. 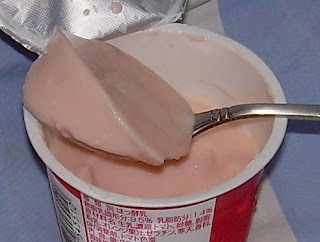 The texture is quite firm and betrays the presence of gelatin to thicken it. Among the other ingredients are tomato puree (12%), orange juice, and sugar. The taste is like a strange combination of sweetened yogurt with a tomato aftertaste. I ate the entire container which afforded me 78 calories of energy and little else besides this review. The main problem is that this is just a freaky mix of flavors, especially with the strong tomato puree aftertaste. It's like mixing yogurt, sugar, and tomato paste together and this tastes as good as that sounds. The company that makes this sells other dairy products including a few of types of pudding which are supposed to be like a famous cheesecake and chocolate cake maker named Tops. 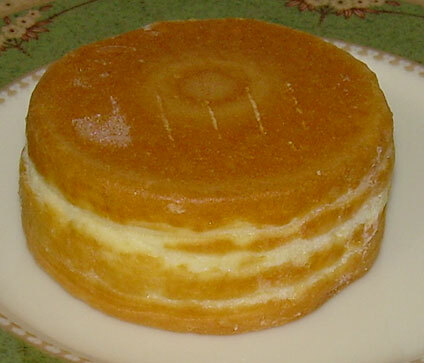 I've had Tops cakes before and they are delicious. 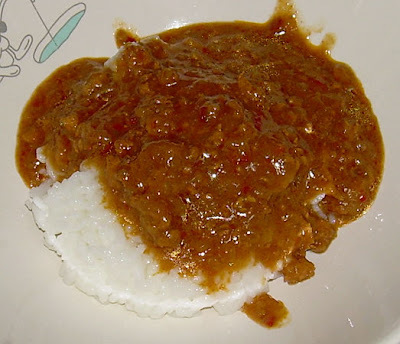 I hope that Hokunyu does them better justice than they did this unholy marriage of tomato paste, sugar, and sour dairy. The Japanese are famous for taking something successful and improving upon it. It's nice to know that they are also capable of taking something successful and making it lame. This gum, made by confectioner Bourbon, is based on the "Cube" series by Lotte, which I reviewed favorably before. I think that the name might be a fusion of "cube" and "drop", but I have no idea what it really means. A lot of the English names of products mean nothing and foreigners who try to make sense of them are looking for meaning where none actually exists. I picked up this sugar-free gum because it is a big container of gum that looks like "Cube" brand for a lower price. It was on sale for 399 yen ($4.74) at Okashi no Machioka discount sweets shop. That may sound expensive for 85 grams (3 oz.) of sugar-free gum, but it is cheaper than similar containers. Strawberry: Weak, slightly tangy and too sweet. It seems to get sweeter as you chew it more until all of the flavor leeches out. Grapefruit: This has a nice grapefruit flavor, but like the strawberry is too sweet and the flavor diminishes pretty quickly. Green Apple: Unsurprisingly, this has the same fake green apple flavoring that you get in most candies. It's fine, and even has a bit of the real feel of an actual apple once the initial burst of stronger flavor wears down a bit. Comparing this to the product it clearly is ripping off made sure this ended up looking worse than it might. The outside of the "Cube" brand gum is kind of crispy and feels a little candy-coated. This is just gum in a cubic shape. That doesn't make it bad. It's just not "good", particularly since the flavor isn't' especially intense and tends to fade fast. 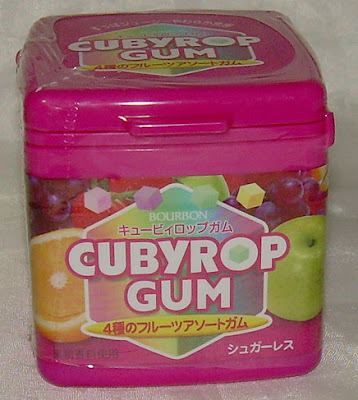 As gum goes, this is just "okay" but I wouldn't buy it again unless it was super, super cheap (300 yen or less). I'd rather just buy real "Cube" gum with all of its textural qualities and stronger flavors. Since the cubes are small, the best way to have this is to chew on 2 or 3 different flavors at once. You get a second-rate Juicy Fruit gum experience that way, and that's about as good as it's going to get. Click this small picture to see a bigger one with more detail. 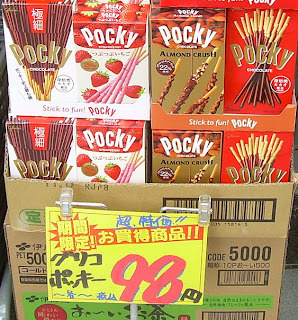 Glico must be pushing to increase Pocky sales since i've been seeing large displays of them at drug stores in my area. The thing that caught my eye is the "Stick to fun" slogan on the display boxes, both because it is in English and becuase it's a pun. You don't often see puns in English on Japanese products because the humor is pretty much lost on the natives (understandably - how many non-Japanese would get a pun written in Japanese?). Though English is often used, it's more ornamental than message-related. The first flavor on the left is called "gokuboso", which is a thinner version with "rich chocolate". 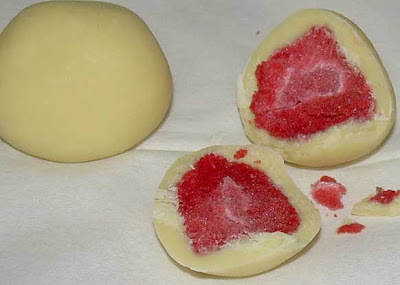 Next to it is "tsubu tsubu" (pebbly) strawberry which has little lumpy bits of dehydrated strawberry in the coating. 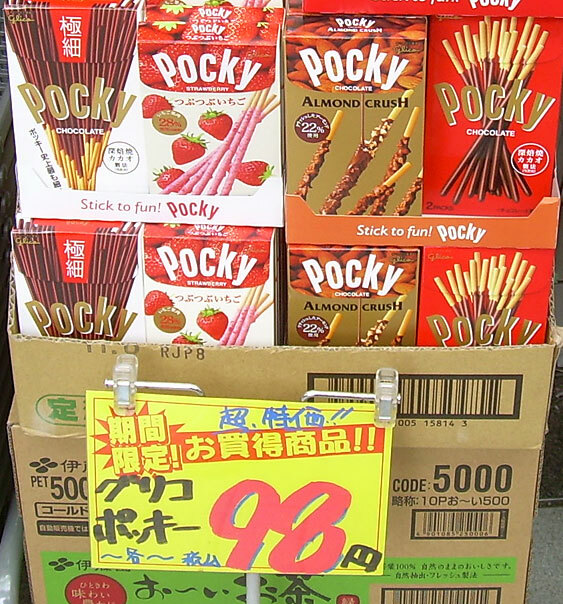 Then, there's the obvious almond crush and regular Pocky. The "gokuboso" is issued as what the Japanese call "renewal" which in English would be "rerun of a minor variation that we're trotting out again." If you'd like to download some freaky desktop pictures with a Pocky theme, they can be accessed here. 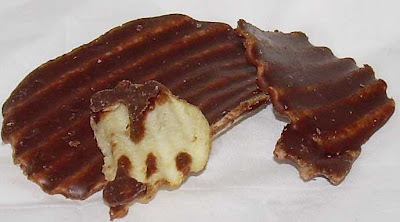 Way back when I started this blog, I reviewed some low rent chocolate-covered potato chip snacks. 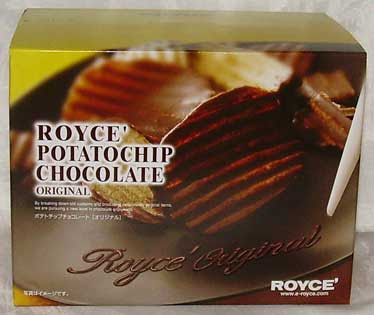 In that post, I mentioned that students had given my husband and I some good chocolate-covered potato chips and those were what had inspired me to try the cheaper ones when I ran across them. 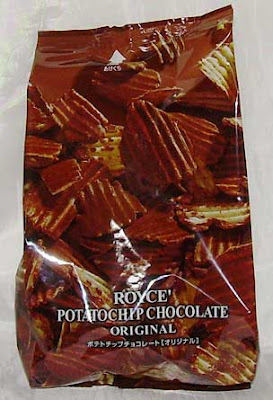 These Royce brand chips are the very ones. They are, at least to me, the gold standard on the whole chocolate-covered chip business. Well, that's if such a pedestrian thing can even have a "gold standard". A rather largish box (190 gram/6.7 oz.) of these was given to my husband, so I had to track down the cost on the manufacturer's web site. This portion, which is very generous is 693 yen ($8.09). You can buy these on-line if you can deal with Japanese, or you can find them at some department stores. You can get cheese chocolate (white chocolate-based) as well as caramel variations. There are also some crunch ball versions which I had had as an office "omiyage" (souvenir) back in my days as a cubicle-dwelling drone. When you open the bag, these mainly smell of potato chips, but, of course, the chocolate is there as well. The chips are fresh, perfectly fried and salted and carry a really nice potato flavor. Quite often, chips are saturated with the flavor of oil. In Japan, often times cheaper chips taste of oil that feels like it has been used too many times.These have none of that unpleasantness. There is a really satisfying mixture of sensation on the tongue with these because the chocolate is cool and the chips feel a little warmer. The chocolate on the chips is nice milk chocolate with just the right balance of sweetness to compliment the salty chips. The only problem with these is that they can be extremely addictive. They are one of the few things which I can lose control while eating and overeat. Fortunately, I never buy them myself and only have to face temptation when given a gift. The only reason these don't get a "very happy" rating is that I actually can't say I'd buy them again, but I'd sure enjoy eating them if I was given another box. Mainly, the issue is that chocolate covered chips aren't the sort of thing I crave unless they are already in front of me as an open bag of temptation. Back home, buckwheat is something I have mainly experienced in pancakes. It's one of those flavors that takes on more appeal as you get older because it has a heartier, earthier flavor than baked goods made with white flour. I first experienced these cookies when I was working in a Japanese office. Occasionally, office ladies would give them out as a treat at tea time, or they'd keep a stash in their desk which they'd offer a few of to me or others who happened to glance at them when cookie was heading to mouth. An errant look in the wrong direction and they'd feel obliged to surrender one to onlookers. I picked up this bag for a mere 99 yen ($1.16) at Okashi no Machioka. 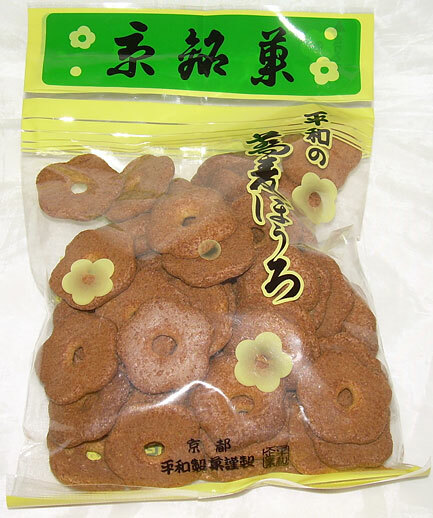 The maker, Heiwa Seika, seems to deal only in these types of cookies in various sizes and packaging. You can find them almost anywhere in Japan though for a similar price, and perhaps from a different manufacturer. With many traditional and "grandma's snacks" like these though, there is almost no variation between the taste and quality of the products. If these interest you after reading this review, pretty much anything that resembles these will taste the same. These cookies smell like the whole grains they are made with. There's also a hint of a "burnt" smell but not the type you'd associate with blackened foods. It's more like something roasted to the limit. It's a nice smell, but not the classic buttery bakery smell that you might expect from a western-style cookie. The texture of these is dictated to a great extent by the copious amount of egg used in them as well as the sugar. They are light and crispy in a pseudo-meringue type of style. They are airy but not in an insubstantial way. The texture is like the love child of a meringue cookie and a biscotti - super crunchy, but easy to bite into. The flavor is of burnt sugar with a slightly caramel sense (without the buttery notes) and of the whole grain buckwheat the whole wheat flour. They are rather lightly sweet. The bag I bought had 56 cookies, and I counted them so that I could do calorie counts very precisely. Each is about 4 cm (1.6 in.) in diameter and 11 calories. 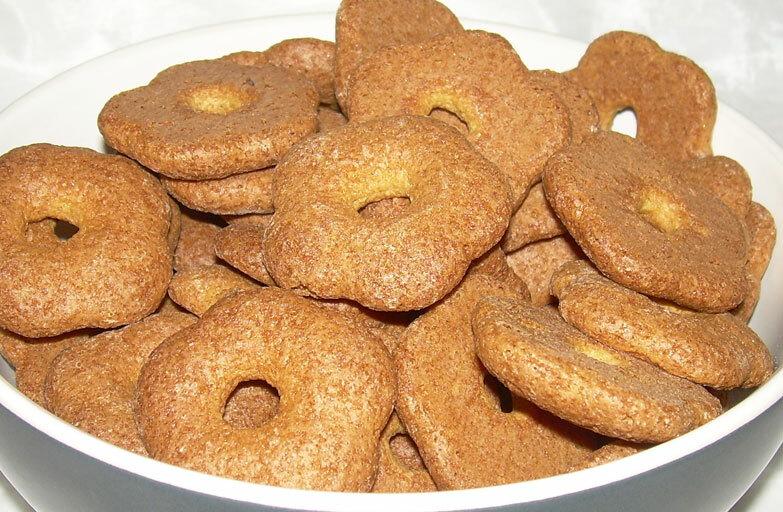 The ingredients list is short, whole wheat flour, sugar, eggs, buckwheat flour, and leavening agent. Most of the flavor is coming from the way in which the cookies are cooked and how it affects the sugar. These are a unique but very tasty cookie. They may not be suitable to everyone's tastes, but I love them. For me, the texture plays a much greater part in my enjoyment of all foods and as a lover of meringue cookies and earthier flavors, these really strike a favorable chord with me. If you love very refined tasting treats full of white sugar and flour, these probably won't do much for you, but I really liked them and will definitely be getting them again and again. Note that they also have a very long shelf life so they'll keep for quite awhile and are good for on-the-go snacking or taking home as souvenirs. There's no way for my readers to know this, but I used to have an internet stalker. This person first discovered me via a personal blog, and followed me to this one. As this person's preoccupation with me started to ramp up, my stalker started to post comments under various made-up names. The main point of such comments was to post moderately critical or contradictory statements. If I said I didn't care for something, this person would say it was a favorite. The reason this stalker (who I believe has since lost interest in me) comes to mind is that one of the sock puppets this party created asserted that I wasn't posting enough beverage reviews. This was despite the fact that I had posted about 25 drink reviews at that point in time. The main residue of my experience with this stalker is that my husband has moderated comments since that experience began so that I wouldn't have to think about them. That's right, my husband filters your comments, not me! A secondary one was that I disabled anonymous commenting (to make it more troublesome to post under fake identities). The tertiary one is that I always remember that person's phony baloney assertion that I don't review enough drinks every time I review one now. So, as I review this Mitsuya Cider, I remember that my stalker wanted more of these types of reviews, or at least pretended to. The last time I reviewed what the Japanese call "cider" it was the Fanta Zero Cider. Mitsuya Cider has been around a lot longer and is a more popular brand than Fanta. I didn't know what to expect, but part of the reason for that was that I had forgotten what the Fanta Zero was like. That was an experience that floated back as I sampled this. This smelled like bubblegum The taste was very hard to pin down. It has some vague elements of ramune with its lemon-lime notes, but it's very weak compared to something like 7-Up or Sprite. It's a light soft drink, which probably suits Japanese tastes with it's less overbearing flavors. It's very heavily carbonated so it really bubbles on the tongue. In fact, this is like a lightly flavored club soda. I can see how it would suit Japanese tastes since, by and large, they prefer subtle flavors. The web site for this is here. The site recommends various drinks with this as a base including adding mint and lemon and honey and ginger. I think that this can certainly be enjoyed "as is", but may be seen as being a bit on the weaker side flavor-wise. It probably occupies a similar space in the market to ginger ale in the United States (though it is weaker in flavor than that beverage). Though this was fine, I wouldn't buy it again because the experience lacked a strong impression. On the bright side, it doesn't taste as strongly of artificial sweeteners as the Fanta Zero Cider. If I had no other option, I'd drink this without hesitation, but I wouldn't seek it out. Click this version to see a larger one with more detail. Sometimes I'm struck by how Japan is far less politically correct than the U.S. when I see certain things for sale. 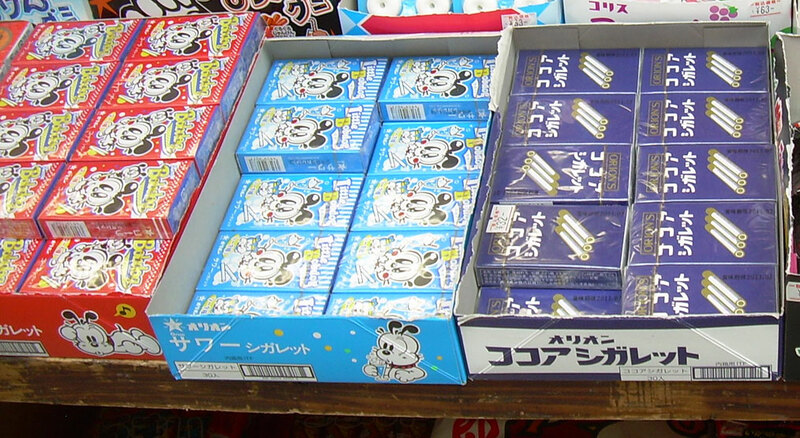 Here is a display of dagashi (cheap kid's snacks) which includes not one, not two, but three types of candy cigarettes. These were declared verboten in the U.S. some time back because people feared sucking on the candy version would lead kids to real smoking habits. The one on the left in the red box is "cola" flavored and the light blue one is "sour". Both are promoted using "little Bob Dog", a character that is licensed and used to promote a lot of goods in Asia in a similar vein to "Felix the Cat". I imagine those who felt Joe Camel was wrong would be apoplectic over the use of this cute little character to push candy cigarettes toward kids. 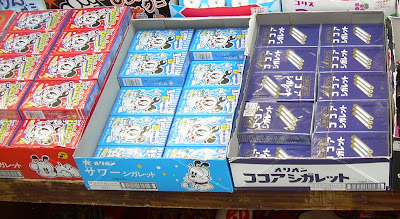 The bland-looking box of candy cigarettes (dark blue) are cocoa. They are actually the most common variety in my area. I see them sold at Family Mart convenience stores and Seiyu supermarket. One of these days, when I run out of other more obvious options, I should review these (though I expect they'll be similar to what I grew up with when I was a kid). I didn't think I would be taking part in the whole rusk fad that is still raging out of control in Japan, but cinnamon treats of any kind are relatively rare here. For those who don't know what a rusk is, it's essentially a dried out piece of bread like zwieback or melba toast. The fad in Japan has leaned largely toward dessicated bits of French toast slices coated in copious amounts of sugar. I was given one and found it relatively vile. It was like a sugar-coated crouton slice. The thing that compelled me about this rusk was not only that it was cinnamon, but also that it is made with Portuguese cake, castella, instead of bread. I've had castella in Japan before and it's not my favorite because it's sticky and relatively bland. The texture is a bit strange for cake as well as it has a unique crumb that I personally do not care for, but I can see how it may be appealing to people of different tastes. This is my first time to review something by Imuraya, a company which produces a wide variety of more traditional Japanese foods including jellies, youkan (blocks of sweetened bean paste), and, unsurprisingly, castella. A lot of what they sell is the sort of stuff which newcomers or those with little experience with Japanese food might shy away from. 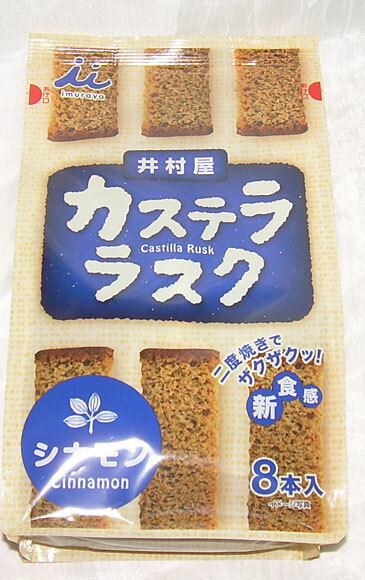 Since rusk is dried out, the usual textural components of castella almost certainly weren't going to apply so I gamely picked up this bag at Inageya supermarket for about 130 yen. There are eight 7-gram pieces in the bag. Each is about the size of three jumbo croutons stuck end to end and individually wrapped. There are 30 calories per rusk. When you open the packet, it smells like cinnamon and coconut though that is not one of the ingredients. My guess is that some preservative or flavoring that is giving off a coconut-like scent. The first ingredient is eggs followed by sugar then flour, sugar water, and cinnamon. The texture is very even and crispy. It is perfectly dried out and easy to bite into. It isn't as hard as a bread-based rusk. The cinnamon flavor is admirably strong and this is sweeter than usual for castella. It is a lot like eating a very finely made, sweet crouton and has hints of sweet sopapillas or the type of cinnamon and sugar coated fried flour tortilla bits that you get from places like Taco Bell. Of course, these aren't nearly as bad for you or as decadent. Mainly, it's the sweetness, cinnamon, and crunch that they have in common. The back of the bag recommends you eat these with jam or by dipping them in milk. They are already so sweet that I don't think that jam would be a good idea. I tried dipping them in milk and coffee but they sucked liquids up like a sponge and practically disintegrated. The texture is too fine for dipping. They don't turn to mush, but rather practically turn to nothing so that was not a good way to enhance the experience. For a rusk, these are pretty good, but ultimately nothing spectacular. I will slowly and enjoyably finish the bag, but I can't see buying these again. It's not that they are bad at all. They are pretty nice. They're just not really all that exciting or impressive. I've been thinking about the product positioning of Tirol (non-premium) candy in Japan and it occurred to me that they represent the same place in the market as Hershey's kisses do in the U.S. They're small candies that are individually wrapped and can be manipulated into a variety of flavors while still maintaining their essential nature. The main difference is that the Tirol candies are more sophisticated based on their more versatile shape, and have about 10 calories more per candy because they are slightly bigger. Being a Japanese product, they also are more elaborately packaged, of course. 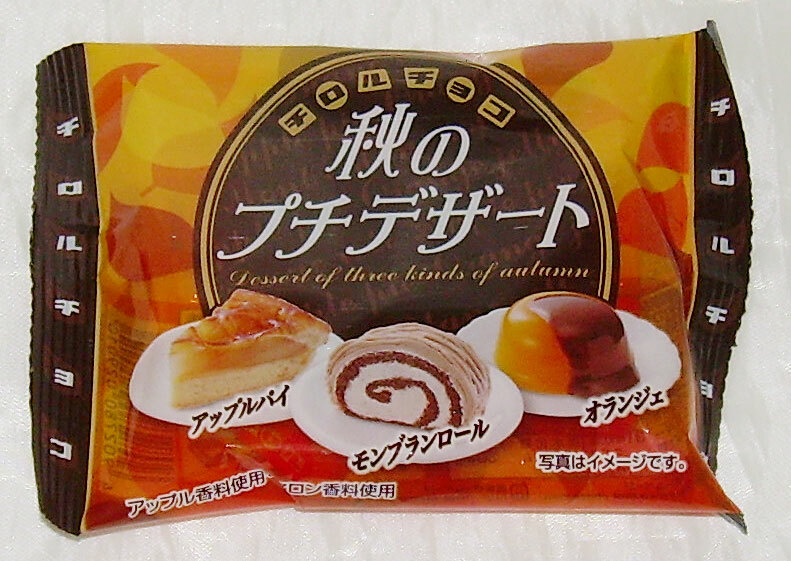 I was drawn to this variety pack of autumn dessert candies at 7-11 (for 105 yen/$1.25) because of the inclusion of Mont Blanc roll as a flavor. All of the flavors have appeal for me, but it's hard for me to resist a sweet based on this chestnut-paste-based pastry. As readers of my other Japan-related blog know, it is my favorite item when I have access to a patisserie. Frankly, I was also drawn to the sophisticated package design and autumn colors as I trudged around in 95 degree F/35 degree C. lingering summer weather. There are three types of candy and nine squares in total. The entire bag is 314 calories and each is about 35 calories. 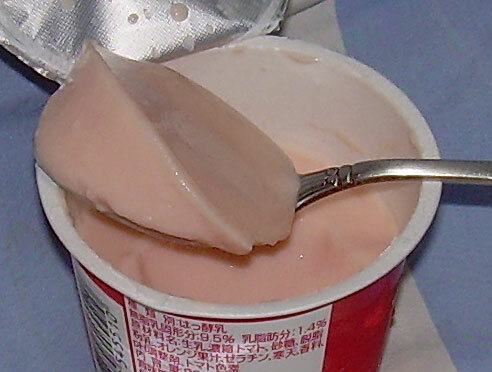 There is a huge list of ingredients since each one has its own separate listing but nice things like real orange peel, apple puree, and mikan (Japanese tangerine) pulp are included as are a lot of not so impressive things like oblaat (the stuff used for medicinal capsule casings), gelatin, and cornstarch. This one smells a bit like coffee, but I think it's a misleading olfactory cue. It really does taste just like the pile of creamy chestnut paste that is heaped onto Mont Blanc cakes. In fact, if it weren't for the difference in textures, you'd probably be hard-pressed to tell the difference between this candy and the real deal. If this weren't so small, the flavor may actually be too intense. 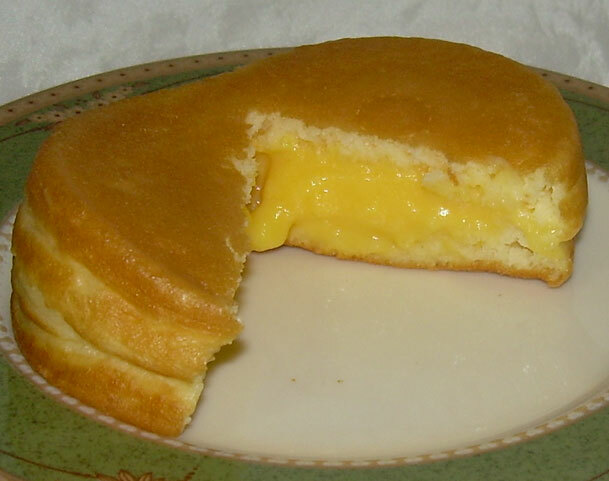 The pastry has some other aspects with it to dilute the flavor but this is purely the taste of the cream. Still, as a small morsel (about 1 inch/2.54 cm. square), it's very tasty as is. The texture is soft and yielding, but not particularly creamy. When I cut this in half for a picture of the interior, it was a little tough because of the thick gummi-like interior. It smells very strongly of orange and the dark chocolate coating combined well with the sweet interior. Still, this seemed to have a bit of an orange Tootsie roll thing going on which I didn't simply love. I think this would have been a bit better had it been milk chocolate or even more intense dark chocolate. The orange flavor is the real deal though, and this was fine. I wouldn't buy it alone, but I'm good with eating the three pieces in this assortment and they won't go to waste. This is exactly the same as the premium apple pie that I loved so much and praised in an earlier review. It's every bit as good as the original with nice chewy bits of apple, a strong hint of cinnamon, crunchy bits of "pie crust" and a white chocolate base. This is a very nice assortment. In fact, it's one of the better ones that I've come across from Tirol in a long, long time and I would recommend it to anyone who finds the flavors appealing. 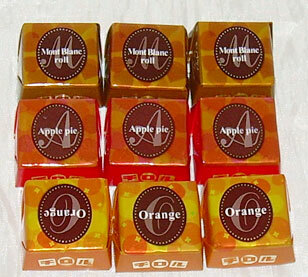 In order of preference, I'd say that I still loved the apple pie best, then the mont blanc roll, and finally the orange. My husband liked the orange one best, so tastes do vary.